Stoneware, relief, 2.5L, inlaid lid. Images depict Holofernes, a general of the Neo-Babalonian Empire; Saul, first king of the united Kingdom of Israel; and Sanherib (not shown), king of Assyria. 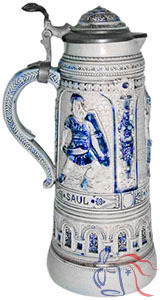 The men themselves were unrelated in either time or location, but all three appear on this stein in full battle dress and were famed for their military prowess.